DUES: The annual dues for an Associate Membership are $5.00. Issues of the Notes and Monographs, Museum Notes, and Numismatic Literature are distributed to all members. MUSEUM: The Society maintains a museum located in uptown Manhattan, New York City, which houses its offices, collections and library. Collections embrace coins of all periods from their inception to modern times, medals and decorations. Selections from its cabinets are on display in an exhibition. The library, consisting of about 12,000 volumes, covers all branches of numismatics. PUBLICATIONS: The Numismatic Notes and Monographs consist of separately issued papers, each on a single topic, of which two to four numbers appear each year. 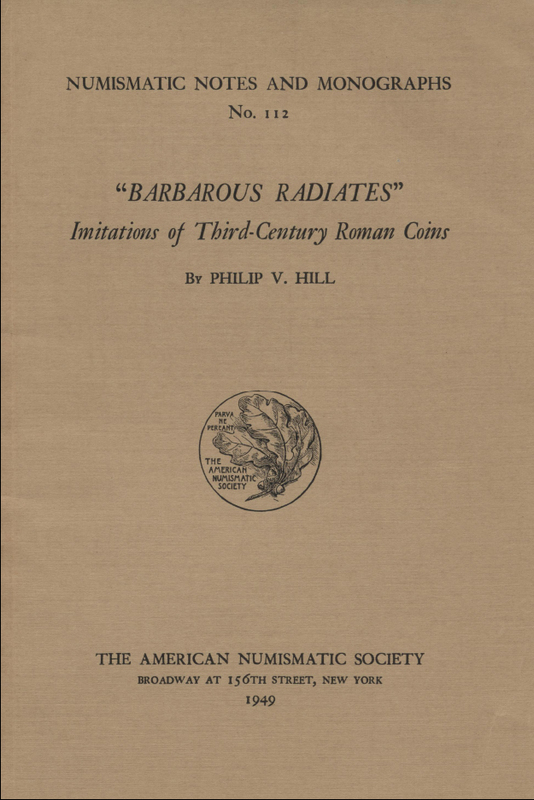 The American Numismatic Society Museum Notes is a publication consisting principally of brief notes and papers on items in the Society's collections, which is irregular in appearance. Numismatic Literature is a quarterly listing current numismatic publications with abstracts of their content. Numismatic Studies is a series which accommodates works of full book length. the merrymount press • boston • u. s. a.
I SHOULD like to thank all those who have co-operated so generously in the preparation of this monograph: The Keeper of Coins, The British Museum, London, for his kindness in permitting so many casts to be made for the plates and for permission to illustrate the thrymsa from Warminster; Mr. B. E. Lynch, of the Map Room, The British Museum, for assistance in preparing the map; Miss G. V. Barnard, The Castle Museum, Norwich, for permission to illustrate two coins from the Redenhall hoard; Mrs. Audrey Williams, The Verulamium Museum, St. Albans (7 coins from Verulamium and one from Canterbury); Mr. W. Bulmer, of Stocksfield-on-Tyne (9 coins from Corstopitum); Mr. H. St. George Gray, The Castle Museum, Taunton (a coin from the Worlebury Camp hoard); Mr. M. R. Hull, The Castle Museum, Colchester (6 coins from Colchester); and Dr. C. H. V. Sutherland, The Ashmolean Museum, Oxford (the imitation of Magnia Urbica in the Ashmolean collection). HOARDS and site-finds from Britain and the Continent frequently contain pieces which cannot possibly be said to have emanated from any official Roman Imperial mint. Of these copies some are very close to their prototypes, others only just recognizable, while others again are of an extreme barbarity. Until comparatively recent years such pieces, whenever they have turned up in excavations, have been labelled simply "barbarous" and thrown aside as useless for the purpose of dating hoards and sites. Careful study of them, however, has convinced me that they can be put to a very definite use, if only they can be classified correctly in some sort of chronological sequence. Unfortunately the task is made heavier by the neglect and lack of interest shown by excavators in the past, but we may still hope that a close study of hoards will throw considerable light upon our researches, although it must be borne in mind that we have only just begun to touch the fringe of the subject. A striking example of the importance of barbarous imitations in dating a hoard came to my notice only recently in the case of that from Redenhall, Norfolk. 1 The fact that the latest orthodox coin was an Æ4 of Honorius with "Victoria Auggg." reverse would at first sight date this hoard to the late fourth or early fifth century, probably about the time of the Roman "Withdrawal." Nor would its barbarous copies, with one exception, postulate a later date, since imitated Theodosian Æ4 were completely absent. (This, however, is not a serious omission, as such copies are very rare in Britain, though common enough on the Continent.) The exception is an interesting coin in more ways than one: it is a minimus, .35 inches in diameter and in fine con- dition, copied from a fifth-century coin with Chi-Rho reverse, and with an obverse head the style of which resembles very closely that of the early Saxon sceattas [ Plate I, 1]. This fact, together with the lateness of its prototypes, which is itself post-Theodosian, indicates that the copy is very much later still in date. The only conclusion to which we can come, therefore, is that the hoard must have been buried at some time during the latter half of the fifth century at least. By whom and why were barbarous imitations made? In the first place, they were the products of unofficial moneyers, working either individually or in groups at irregular mints scattered throughout the Empire. It is indeed probable that the authorities, while officially frowning upon such irregularities, would be led to tolerate them, if only because in course of time they came to be in constant and popular use through providing a very necessary supply of small change—a commodity in which the orthodox Roman issues were usually sadly lacking. Secondly, they were struck both by tribes bordering on the Empire who wanted coins for their own use and by tribes within the imperial boundaries, probably for the express purpose of supplementing the issues of the official mints, especially in times of political danger and economic insecurity. Lastly, it seems that on rare occasions an official at a regular mint would try his hand at the business, since pieces exist which are not quite orthodox in style, although presenting every detail with somewhat suspicious exactitude: nevertheless, they are betrayed by their curious irregular lettering and the long, pointed nose and staring eye of the "semi-barbarous" or "slightly irregular" portraiture 2 [ Plate I, 2]. The makers of barbarous imitations employed numerous methods of flan manufacture, some of them most ingenious. Most common of all were the true or "prepared" flans, which were produced in various ways: by flattening hot globules of metal [ Plate I, 3]; by overstriking complete coins, orthodox or barbarous, without first erasing the original types [ Plate I, 4]; by filing away the types of regular coins (usually Æ3) [ Plate I, 5] or by cutting them into quarters [ Plate I, 6] or roughly rounded fragments prior to restriking with the new types; and by hammering out and cutting up coins of still larger module, again prior to restriking [ Plate I, 7]. In connexion with the last-named process we shall see later that orichalcum coins of the Early Empire appear to have been subjected to this treatment in many cases, probably during the period of metal scarcity. Also in post-Roman days, when metal became increasingly difficult to obtain, the method of making a flan by clipping it with shears from a very thin sheet of metal [ Plate I, 8] was frequently employed. Such flans have sharp angles and edges and often possess a "tail" where the shears have gone astray in the cutting; otherwise they are tolerably neat. Another method was to cut flans from drawn-out rods of metal, but of course only the very small pieces known as "minimissimi" would have been produced in this way [ Plate I, 9]. They are naturally perfectly round, but they often exhibit signs of weakness in the centre, the result of the tensile strain which was placed upon the rod as it was being drawn out. Occasionally barbarous copies were not struck but cast [ Plate I, 10]: such pieces can easily be recognized by the "tail" which usually develops in the process or by the "bevelled" appearance of the edge, as well as by pit-marks if they were cast in a sand-mould. Towards the end of the fourth century, when metal was beginning to become scarce, a tendency arose to reuse earlier (mainly third-century) coins, either orthodox or barbarous, clipped to Æ4 size [ Plate I, 11]—the normal module of the regular coinage at this time—and the same tendency is noticeable at a later date when clipped siliquae passed current 3 [ Plate I, 12]. Although there are so many varieties of barbarous copies and although actual die-identities are very infrequently discovered, a study of hoards and site-finds reveals the existence of regional "schools of art," each with its own stylistic peculiarities and idiosyncrasies. It is far more than a general vague resemblance between coins from the same locality: it is a definite affinity in the treatment of both obverse and reverse, almost as if the coins came from the same workshop or even from the same hand. To take but two examples, from north and south Britain respectively, Corstopitum (Corbridge, Northumberland) has yielded no fewer than seven such instances of stylistic affinity and Verulamium (St. Albans, Herts.) has yielded at least two. More general resemblances are also apparent in coins from the same district. In the north, especially Corstopitum, the tendency seems to be towards "lined-in" figures without relief [ Plate I, 13], while southern sites produce coins with bolder and more "solid" figures in high relief [ Plate I, 14]. From the north also we very often find examples of a herring-bone pattern decorating the reverse figures, while both obverse and reverse designs are in a circle composed of one thin line crossed by short lines at right angles to it ( ) [ Plate I, 15] or of a thin line with the shorter lines on one side only ( ). The exergual line, if there is one, is decorated in the same way. M. Blanchet has also noticed the existence of regional "schools of art" on the Continent. 4 Their presence, both in this country and abroad, suggests an ordered discipline in the manufacture of imitations rather than haphazard attempts, although of course this does not necessarily mean that private workshops could not have been set up by individuals as well. The evidence for these unofficial mints is so plentiful that we may accept their existence as fairly certain. Die-identities from various sites in this country and abroad are the surest indications of an unofficial mint—and, moreover, of one which is in the vicinity of the site where the coins were found. We might also suppose, with some reason, that the existence of the regional styles of "art" noted above could suggest the existence of irregular mints, as could also the evidence of individual coins. A few examples may be given to illustrate our point. The first is a barbarous "Fel. Temp." from Lydney Park, Glos., with the mint-mark , and Mr. J. W. E. Pearce has suggested that it may have emanated from the nearby colonia of Glevum (Gloucester), which, therefore, may have been the site of an unofficial mint. A similar piece with PLN in the exergue (provenance: Maiden Castle, Dorset) seems to have been struck at London, but, since the London mint had been closed for over twenty years before the introduction of the "Fel. Temp." series, the only possible explanation of this extraordinary mintmark is that there was an unofficial mint striking barbarous pieces at London. Another "Fel. Temp.," this time in my own collection, also appears to bear the mark of London (•PLN•) [ Plate II, 1]. The presence in hoards and site-finds of thin blanks—flans of earlier coins carefully filed down ready for restriking—may indicate with greater certainty a nearby place of production of barbarous copies. Site-finds from Corbridge and Colchester have yielded such pieces and the ten blanks (six clipped from thin sheet-metal and four cut from a rod) in the Kiddington, Oxon., hoard, which was buried c. 420–430, a decade or two after the "Withdrawal," may tend to the same conclusion. The most definite evidence, however, has come from the continent, where at Autun and Éprave the actual workshops themselves have been unearthed. These will, however, be discussed in a later context. Legends on barbarous imitations range from correct and intelligent copies to a hopeless jumble of meaningless letters or even mere lines and dots. Minimi (small pieces of between .50 and .10 inches in diameter) are usually anepigraphic, doubtless owing to the extremely small size of the dies employed. Interesting varieties of legends often occur. There are those which, although accurate or reasonably so, bear no relation whatever to the types which they purport to describe. A barbarous Tetricus I—of a fine, virile style, certainly better than that of any orthodox piece of the reign—in my collection has the reverse legend HER DEV ...... SI (from the "Herc. Deusoniensi" coins of Postumus with Hercules reverse) combined with the type of Sol [ Plate II, 2]. The figure of Fortuna may be found with the legend of Salus [ Plate II, 3], Spes with that of Pietas or a Genius described as Virtus. From time to time we come across pieces which are of (apparently) perfectly orthodox style but which have hopelessly blundered reverse legends. The reason for this is quite obscure, unless they were the products of workmen attached to official mints who intentionally blundered the reverse legends [ Plate II, 4], for it is inconceivable that any die-sinker who was intelligent enough to master the intricacies of both obverse legend and reverse type and to engrave an excellent portrait should have failed so completely to produce an intelligible reverse legend. Anyone who studies barbarous imitations at all closely is struck by one very remarkable fact which is especially noticeable in the more degraded and illiterate specimens. It is a tendency towards emphasis upon one particular attribute or part of the design, often to the complete exclusion of others. In the case of Claudian copies it is usually the shield of the Minerva reverse which receives this emphasis [ Plate II, 5]. With barbarous radiates it is the radiate crown on the obverse (which always remains even after the rest of the type has entirely disintegrated, cf. Plate II, 6) or a part of the reverse figure—the left arm of Pax encircling the sceptre, the skirt-folds of Spes or her body which often develops into a fiddleshape, the left arm and whip of Sol, the double curve of the arms of Pietas or the palm of Hilaritas [ Plate II, 6, rev.]. In fourth-century copies the emphasis is placed upon such parts of the design as the top of the standard in the "Gloria Exercitus" type, the horse [ Plate II, 7], the legionary or the spear of the "Fel. Temp. Reparatio," the wreath of Victory in the "Victoria Auggg." type and the captive in the "Salus Reipublicae" type. Similarly, one particular letter, such as the X in PAX, the V in FORTVNA or AVG, or the E in FELICITAS [ Plate II, 8], may be large and pronounced or even survive after the remainder of the legend has sunk into the depths of barbarity or has disappeared entirely. The only explanation of these phenomena is that those letters and attributes which were emphasized were the ones which especially struck the engraver's imagination and which seemed to him the most important parts of the composition. Another characteristic—one which seems to be confined to "barbarous radiates"—is the absorption of one type into another. The most common instance of this is the assumption of the sceptre of Pax by a type which normally does not possess this attribute. This confusion of types is especially frequent in coins of extremely degraded style and may be explained by the facts that the engraver had in mind the attribute of another, more common, type (such as Pax) while he was working on his die. Indeed it is to be noted that the types whose attributes have been absorbed into other types are usually those, like Pax, Spes, Pietas and Sol [ Plate II, 9], which are the most common in imitation. So much, then, for the general characteristics of barbarous copies. The subject of our present study is, however, but one section, although a large and important one, of a far more vast and intricate field. It is that class of copies which bear a radiate head on the obverse and a figure (usually a diety or a personifica- tion of an abstract idea) on the reverse and which are placed under the generic heading of "barbarous radiates." Their prototypes were the debased antoniniani of the late third century, those struck by the Gallic Emperors (259–273) being most commonly imitated. Heading the frequency-list of imitations are those taken from the coins of the Tetrici (270—273) [ Plate II, 10, 11] with, second, those from the posthumous issues of Claudius II (270) [ Plate II, 12], usually with the Altar reverse, and, third, those from the coins of Victorinus (268—270) [ Plate II, 13]. Imitations of Postumus [ Plate II, 14] are uncommon and those of Gallienus [ Plate II, 15], Quintillus [ Plate II, 16] and Probus [ Plate II, 17] are rare, while only a few odd examples exist of Aurelian [ Plate II, 18], Tacitus [ Plate II, 19] and Numerian. There is also only one recorded instance of a female head on a barbarous third-century coin: its provenance was Caister St. Edmund, Norfolk. 5 Nevertheless, there is a coin (provenance unknown) in the Ashmolean Museum, Oxford, which undoubtedly shows a female head on the obverse. It has: obv. M ......... V, bust of Empress (Magnia Urbica? ), draped, r.; rev. legend uncertain: female figure standing 1., Æ .35 [ Plate II, 20]. Although discovered over fifty years ago, this hoard has only just been published in Num. Chron., 1946, pp. 157–159. The elevation of a pretender to the purple provided an exceptional reason for the striking of barbarous imitations, but if we exclude Carausius, whose case is somewhat different, the only example so far known is that of Bonosus, usurper in Rhaetia c. a.d. 280. There are also one or two very doubtful coins attributed to the usurpers Aureolus and Amandus, but these, together with the barbarous gold piece which has been given to Odenathus (Rev. Num., 1846, p. 278; Cohen, 2nd ed., VI, p. 212), must necessarily be treated with considerable reserve. A coin which, from the obverse legend, seems to have been copied from a piece of Vaballathus is in my own collection: it has a Hilaritas reverse. Is the clipped siliqua the "denarius" of which Gildas speaks in his De Excidio Britanniae (c. 546 a.d.)? Rev. Num. 1940, pp. 79–80. To find a suitable method for the classification of barbarous radiates is not easy. We cannot divide them, according to their prototypes, into moneyers or reigns, as is possible with the copies of Republican denarii or of Imperial coins of the preceding three centuries, owing to the vast quantities of unassignable coins, which are either anepigraphic or whose obverse legend bears no resemblance to an emperor's name and titles. The usual method, that of classification by reverse types, is, if less scientific, at least more utilitarian. A natural starting-point is the division of the types into animate and inanimate: the former may further be subdivided into male figures, female figures, birds, animals and the inevitable miscellanea; the latter into altars, sacrificial implements, abstract designs, dismembered types and miscellanea. It goes without saying that numerous unclassified incerta must be added to both subdivisions. The male types so far noticed are: Aesculapius, Cabirus (? ), Caesar, Emperor, Genius, Hercules, Jupiter, Mars and Sol. Of these the Sol type is undoubtedly the commonest, probably on account of its virility and action, which made it popular among the semi-Romanized communities who struck these pieces [cf. Plate II, 2]. Among the imitations, as among the official issues, female types are far more numerous than male. They are: Abundantia, Aequitas, Annona, Concordia, Dacia, Diana (? ), Felicitas, Fertilitas, Fides, Fortuna, Hilaritas, Indulgentia, Juno, Justitia, Laetitia, Liberalitas, Libertas, Minerva, Moneta, Nemesis, Nobilitas, Pax, Pietas, Providentia, Roma, Salus, Securitas, Spes, Tutela, Uberitas, Venus, Victory and Virtus. Pax is the commonest of these types, followed closely by Spes [ Plate II, 9]. Fides, Fortuna, Hilaritas, Salus and Virtus are by no means scarce, but the remainder varies from scarce to extremely rare. Not all the varieties of the same reverse type are of the same frequency, however. For example, Pax holding a transverse sceptre is rare; Pax holding a cornucopiae is very rare; while Pax holding a vertical sceptre is extremely common. The frequency depends largely upon two factors—the availability of the prototype for copying and the ability of the engraver to render the design reasonably accurately. In the example quoted above, the cornucopiae and transverse sceptre of the two scarcer varieties of Pax would often be rendered so badly in imitation [ Plate III, 1], owing to their being "weaker" attributes than the vertical sceptre, with a consequent difficulty in their interpretation, that the whole type would soon cease altogether to be copied. Apart from these reverses, which can definitely be traced to a Roman original, there are very many others, with both male and female figures, whose attribution is quite uncertain, either because an essential part of the design is off the flan, or because the type has become so barbarized as to make it unrecognizable [ Plate III, 2], or because the die sinker has used his imagination to such an extent as to create an entirely new type. Of the remaining reverses the sole representative of the "bird" section is the eagle of the posthumous issues of Claudius II, which, however, was fairly frequently copied. The next subdivision, that of animals, is rare: its examples are mainly taken from the legionary series of Gallienus, Postumus and Victorinus and consist of a centaur, a doe, a goat, a griffin, a Pegasus, a stag and a wolf. There are also certain horse and dog types, which were probably native in origin, as no prototype can be found for them in the official Roman series; in fact, a very good case for the derivation of the horse type from Ancient British coins has recently been stated. 6 Among the miscellanea are: an uncertain standing figure (of which numerous examples exist) and certain rare types with two (or three) figures, a seated figure, an equestrian figure [ Plate III, 3] and a radiate head repeated on the reverse [ Plate III, 4]. The commonest inanimate type is undoubtedly that of the Altar from the posthumous issues of Claudius II, although the Sacrificial Implements type, mainly of Tetricus II, was also very popular, perhaps owing to its adaptability to stylization. The miscellanea are: a winged caduceus, crossed cornucopiae, a galley, clasped hands, letters, a temple, a trophy and captives and coins with merely a blank reverse. Abstract designs occasionally occur, but these were solely the products of the engraver's imagination and could not possibly have been derived from any Roman prototype. The large class of coins with dismembered reverses must have owed its origin to the imitation of worn or badly struck originals; some of these bear indications of having been copied from animate figures, although on most of them the type has so completely disintegrated as to be composed of little more than a few lines and dots [ Plate III, 5]. As with other imitations, barbarous radiates may be divided stylistically into three grades, 7 the order of degradation being determined by a study of the closeness to the original of the obverse portrait and the attributes and posture of the reverse figure. One finds that eventually persistent and successive copying of the same type leads to complete stylization of the reverse, some types, such as Sol, Spes and the Sacrificial Implements, lending themselves to stylization more readily than others. Grade I is accurate, or reasonably so, with a fair likeness in the obverse portrait and a correct representation of the details of the reverse figure: legends are usually intelligible with good lettering, and coins of this grade are obviously the work of competent craftsmen with a knowledge of Latin as well as of their craft [ Plate III, 6, 7]. In Grade II the standard of workmanship has fallen off quite considerably [ Plate III, 8, 9]. The head or bust on the obverse is no longer a portrait, one at least of the attributes of the reverse figure is missing (sometimes both have disappeared) and the posture of the figure becomes stiff and unnatural. Legends tend to become more and more blundered until they are almost unintelligible: some large-size copies are even anepigraphic. 8 Grade III reaches the lowest stage of barbarity [ Plate III, 10, 11]. Often its coins have types which, on both obverse and reverse, are breaking up or have completely disintegrated: if not, stylization is the rule. Legends (if present at all) are totally blundered with, sometimes, "letters" which can have existed in no conceivable alphabet but only in the mind of the engraver. The most degraded specimens of this grade are those coins with merely a suggestion of a radiate crown on the obverse and a succession of lines and dots to do duty as a reverse type [cf. Plate III, 5]. Appendices to this monograph give lists of (A) British hoards, (B) British sites and (C) foreign hoards which have yielded radiate copies. Although Appendices (A) and (B) are by no means exhaustive, they will at least be sufficiently representative to present a general picture of the distribution in this country of such imitations. Two facts emerge: firstly, that they circulated very widely and, secondly, that they were in use from the third to the fifth centuries, and even later. We shall see presently that this continuity of circulation implies a continuity of manufacture, which vitiates the natural assumption that radiate copies were contemporary with their prototypes and can all be classed together in the third century. A further division of barbarous radiates, this time on a basis of module, may be made. Needless to say, no definite line can be drawn between the larger copies and the minimi, but it will be convenient to take it to be .50 inches or 12.5 mm., all coins of this diameter and less being classed as minimi. At the bottom of the scale are the tiny pieces ranging from .30 to .10 inches which are now universally (though ungrammatically!) known as "minimissimi." These ridiculously small coins, of the smallest of which it takes as many as fifty to cover an English halfpenny, can only have been struck and passed current in days of extreme poverty after the whole economic structure of the country had collapsed. Such a state of affairs must have applied during the period of metal scarcity (c. a.d. 450–550?) long after the Roman "Withdrawal" and indeed the extreme barbarity of these minimissimi certainly suggests a Britain which had "gone native." Sutherland: Coinage and Currency in Roman Britain, p. 126; Pl. IV, 6. By my friend, Mr. Gilbert Askew, F.S.A. (to whom I am indebted for many useful suggestions in connexion with barbarous copies), in Num. Chron., 1943, pp. 104–105. See Num. Notes & Mons. No. 65 for Sutherland's grading of Claudian copies. Radiates may be graded on much the same lines, except that we are omitting his fourth grade—coins with obverse and/or reverse type reversed—since the results would not justify the work involved. Minimi exist in all three grades and, owing to the smallness of the flans, many minimi of even Grade I have one or both legends missing. It is obvious that a close study of hoards will provide evidence for dating barbarous copies. Certain hoards, 9 which must have been buried in the early seventies of the third century, probably during the economic crisis precipitated by the unpopular reform of Aurelian, prove beyond question that barbarous radiates were circulating side by side with their prototypes. From the contents of these hoards it may be stated that all Grade I copies of good module, together with many of Grade II, were contemporary imitations. The burial of other hoards, 10 containing large-size radiate copies interspersed with regular coins to Carausius or Allectus, may be dated to the last decade of the third century (some, perhaps, having been buried during the troubles accompanying the fall of Allectus in 296), thus indicating that barbarous radiates of this size were circulating and probably being manufactured, down to c. 300. Others 11 show that they were current, albeit in diminished numbers, if not actually being struck, well into the fourth and fifth centuries. We may be fairly certain, therefore, that all Grade I and some Grade II copies are contemporary, or nearly so, with their prototypes and even certain large-size Grade III imitations give the impression of being early in date, having been taken from worn or badly struck originals or representing perhaps the work of illiterate craftsmen. Radiate minimi, on the other hand, present a problem which is at once difficult and fascinating: yet here again a study of hoards will at least simplify it even if it does not solve it completely. The Brougham, Great Chesters and Segontium II and III hoards all must have been buried towards the end of the third century. In them regular coins, mainly of the Gallic Empire, but also sometimes of the British Empire of Carausius and Allectus (287–296), were found associated with radiate minimi. Decisive for date, however, was the Verulamium Theatre hoard which was composed entirely of radiate minimi. This is such an important hoard for our purposes that it will repay us to examine it more closely. 80 large-size barbarous radiates (at least), undoubtedly contemporary with their prototypes. 86 ranging from 7 to 8 mm. in diameter. 486 ranging from 5 to 7 mm. in diameter. 44 ranging from 4.5 to 5 mm. in diameter. In addition there were numerous fragmentary coins and scraps, making a total of about eight hundred pieces, all barbarous imitations. The find-spot was 9 inches below the theatre stage, almost exactly on its central line, and 18 inches from the inner wall of the curtain-slot. Incontrovertible archaeological evidence showed that the reconstruction of the theatre, which included the building of a new stage, could not have taken place after c. 300 a.d. The cement of which this new stage had been constructed was completely intact, without even a crack, so that it formed an effective seal between the layer of third century material below it and the layer of fourth century material above. The latter contained numerous coins of fourth century date which were completely lacking in the former. If the hoard had been deposited later than c. 300, it could not possibly have found its way to the below-stage layer: such a possibility is immediately negatived by the perfect condition of the cement. It must, therefore, have been buried before the reconstruction of the theatre in c. 300. Moreover, in the orchestra of the theatre there were found minimi of hoard-type associated with coins of Carausius: thus the evidence for the hoard's late third-century date is complete. It would appear fairly certain, then, that radiate minimi were being produced before the end of the third century, contrary to the former beliefs of British numismatists who were inclined—although quite logically—to assign all minimi to a date after the Roman "Withdrawal." The Verulamium Theatre hoard is definite proof of the fallaciousness of such a theory and since its discovery we have had to reorient our ideas very radically. This is not to say that radiate minimi were not produced later: as we shall see, we have convincing evidence that they were struck contemporaneously with the tiny pieces derived from the fourth-century "Fel. Temp." reverse which may very definitely be assigned to the period of copper scarcity. Nevertheless, there are certain strong stylistic differences between the early and the late minimi [cf. Plate III, 7 and 11]. The former are usually of good, neat style and excellent technique, although struck on flans which are in most cases too small for the dies: the obverse head, though no portrait, is generally well engraved and carefully executed, and the reverse figure is accurate both as regards attributes and posture. Late minimi, on the other hand, are usually extremely crude attempts at portraiture and design, which is often breaking up and quite unassignable to any recognized prototype. Hoards indicate that radiate minimi first appeared on the economic scene towards the end of the third century—say, 290 or thereabouts. The next question to be decided is the reason for their production. Their re-appearance in later days was, of course, the result of the metal shortage, but in the third century no such conditions prevailed. In fact, the precise opposite seems to have been the case, for the base Gallic antoniniani, which had flooded the markets of Britain and the west only a couple of decades previously, were still in circulation in vast quantities, and hoards even suggest that both they and their imitations were current well into the fourth and fifth centuries. The key to the solution of the problem may well be in the great re-coinage carried out by Carausius, the British Emperor, in c. 290, in a laudable attempt to place the economy of Britain upon a more stable footing. He replaced the base pieces of the Central and Gallic Empires (already virtually demonetized by Aurelian's reform) by a new well-silvered antoninianus of good weight, reducing the former merely to a nominal value. To remedy the shortage of small change consequent upon the demonetization and (presumably) withdrawal from circulation of the former currency, private persons and unofficial mints would strike these minimi, the circulation of which would be purely regional. The continuance of the use of radiate minimi in Constantinian days, just before they were superseded in popularity by minimi with fourth-century types, is evidenced by two hoards, from Filton and Hove, both of which were buried c. 320. Later still (c. 400) another series of hoards 12 indicates not only the persistence in circulation of radiate minimi a century or more after their first appearance, but also the comparatively early manufacture of diademed minimi, mostly with "Fel. Temp." types, for the purposes of small change. But still another factor, which undoubtedly had much to do with the causes of the production of barbarous minimi, was starting to affect the economic life of the Empire at this time. The metal scarcity which became acute some fifty years later was already beginning to make itself felt in the last years of the fourth century, as is shown only too clearly by the closure of mints and the reduction of the regular bronze coinage to Æ4 module. Although they had failed to compete in popularity with the "Fel. Temp." imitations, barbarous radiates had not been completely superseded. As we have seen, both large-size copies and minimi were still circulating towards the end of the fourth century, and hoards 13 show that even in post-Roman days, during the fifth and sixth centuries, radiate minimi were again being manufactured, though of a very degraded style and fabric. For more than a century and a half after the "Withdrawal," the copper scarcity naturally precluded the manufacture of any pieces above minim module until well into the sixth century, when (if we can draw any conclusions from the solitary hoard at our disposal—the Richborough IV hoard) the size of the current money seems to have undergone a considerable increase. In the absence of other hoards to which such a late date can with any certainty be given, however, it is neither possible nor wise to attribute more than a local significance to this phenomenon and to assert that copper was in better supply throughout the country at this time. Richborough, and in fact all Kent, was then in the hands of the Jutish invaders, and it has been suggested 14 that some, at least, of the coins of the radiate hoard were struck not by the Romano-Britons but by their Teutonic conquerors who, having attained a more settled way of living, were now beginning to feel the need of a coinage of their own. It may well be, in fact, that some of these pieces represent the earliest attempts at a native "Saxon" coinage, while others in the hoard, more closely akin to the Romano-British styles of imitations, seem to indicate that the conquerors made use also of barbarous coins which they had obtained by plunder or as "treasure trove." Consequently, we may surmise that copper was not so scarce among the invaders as among the invaded, and that this was the reason for the apparent improvement in the metal position, which seems therefore to have been purely local. We have seen from hoard evidence that radiate imitations were in fairly continuous use from the third to the fifth centuries and even later. From this continuity of circulation we may assume a continuity of manufacture, so that it is not difficult to imagine the persistent, if sporadic, striking of these pieces throughout the fourth century. The evidence of overstrikes underlines very strongly that of the hoards. Admittedly, examples are by no means common, but we may quote two here which support our hypothesis. One, in my own collection from Yorkshire (?Methley), is a Grade III barbarous radiate with Altar reverse overstruck on a hammered-out Constantinian "Vota" coin (issued probably 333 a.d.) [ Plate III, 12]; the other, from Corstopitum, is a radiate with a disintegrated obverse and reverse over-struck on a "Victoriae Dd. Auggq. Nn." of Constantius II or Constans (issued c. 340 a.d.) [ Plate III, 13]. That barbarous radiates underwent a revival in popularity in post-Roman times is not to be doubted, although the reason for this is not easy to discover. Since, during the period of metal scarcity, no further supplies of coin were being imported, the Romano-Britons had to rely upon very crude home-produced pieces to supplement the worn late Theodosian bronze which were the last coins to have been received from the official imperial mints. Moreover, since the difficult conditions which prevailed at the time owing to the Saxon invasions must have rendered impossible the working of the British mines, the only source of supply for the flans of these small and degenerate pieces would be the coins of former centuries dug up from the earth of those of more recent times which still remained in circulation. Occasionally one comes across barbarous radiates of a "brassy" appearance. These pieces are usually of very crude workmanship and struck on flans of varying shapes, not very often nicely rounded. It has been suggested 15 that they were made from orichalcum coins (sestertii and dupondii) of the Early Empire, hammered out to the required thickness, roughly chisel-cut into small pieces and stamped with the new dies [cf. Plate I, 7]. Indeed, the makeshift way of manufacturing the flans and of striking the coins indicates neither a very stable economy nor a very settled political situation, and some of the cruder specimens may even suggest a post-Roman date. If, then, as seems likely, the Britons of the fifth and sixth centuries were forced to rely upon obsolete money for the production of their coins, why should they not have relied upon obsolete money for the types? We know that orthodox pieces of the third century as well as their imitations were current as late as the end of the fourth century and there is certainly no reason to suppose that they passed out of currency in post-Roman days; moreover, many hoards which had been buried at the time of Aurelian's reform must have been dug up by the hard-pressed and poverty-stricken Britons of the later fifth century and we can imagine that their contents would have been eagerly seized upon both for the metal which they contained and for their possibilities as prototypes. Constantinian and other fourth-century hoards would suffer a like fate—hence the apparent segregation of radiate and diademed minimi which, although circulating contemporaneously, are but rarely found associated in the same hoard. The evidence of foreign hoards has now to be considered. A selection of these is given in Appendix C and, in spite of considerable differences in the history and economic conditions of Britain and the Continent, they corroborate in a singular manner the evidence of British hoards as regards the date and circulation of our copies. The fact that barbarous radiates were contemporary, or nearly so, with their prototypes is indicated by certain hoards of which those from Ahrweiler, La Blanchardière, Cattenes, Evreux and the Mazeau Marsh are sufficient proof. Of hoards containing radiate minimi, that from Jublains is undoubtedly the most important. It seems reasonable to conclude that this hoard was put into the earth at about the time of Aurelian (270—275)—whose reform, incidentally, was just as unpopular in Gaul as it was in Britain, so that it must have been the cause of the burial of hoards of the old money in both provinces. From this hoard we may be right in supposing that radiate minimi were being struck in Gaul some years before their first appearance in this country—a conclusion which is amply supported by the evidence of other hoards. 16 Indeed, the "Gallic" air of many early minimi in this country seems to point to their importation from Gaul, and the late Mrs. Wheeler, in her report on the Verulamium Theatre hoard, 17 suggested that "they were not of British manufacture." 18 This, of course, is a reasonable enough conclusion if, as seems likely, the production of radiate minimi on the Continent preceded their production in Britain by some twenty years. That both large-size copies and minimi were still circulating on the Continent, as in Britain, at the end of the third or beginning of the fourth century, is shown by such hoards as those from Niedderrentgen, Étival-lès-Le Mans and Venèra, while the Hansur-Lesse and the Ettelbruck II hoards indicate the continued circulation of large-size barbarous radiates during the early years of the fourth century. The Lavoye hoard, of 1,760 copies ranging from 14 mm. down to 6 mm. in diameter, would seem to belong to the seventies of the third century, as obverses based on coins of Gallienus, Claudius II and the Tetrici have been noted, but the fact that it was contained in a fourth-century vase postu- lates a somewhat later date for its burial. Of all the Continental finds, however, that from Autun is probably the most interesting. In a layer of carbon and ash there were found some broken crucibles, one still containing bronze; in one corner were numerous worn radiate minimi, obviously destined for the melting pot, while close by was a large quantity of minimi with Constantinian types (6–8 mm. in diameter), all in mint state. There is little doubt that we have here definite evidence of an unofficial workshop and proof not only that radiate minimi were still circulating in Gaul during the first half of the fourth century but also that, towards the middle of the century, they were being superseded, like their British counterparts, by minimi copied from contemporary coins. The revival of radiate imitations seems to have taken place on the Continent rather earlier than in Britain, as is probably shown by the Wancennes hoard, which contained radiate minimi in association with two orthodox coins of Valentinian II, so that it may be dated to c. 390, and the Surcy hoard, which contained one orthodox Tetricus I, four barbarous Tetricus I and coins of the fourth century to Eugenius (392–394). The survival of radiates, both of large module and of minim size, at the end of the fourth century is indicated by both these hoards, as well as by the Éprave hoard (c. a.d. 400). Here, as at Autun, an irregular workshop was discovered, with several thousand radiate minimi 3 mm. in diameter, a heap of slag and an iron crucible containing copper waste and grains of bronze. Finally, a hoard of 2,197 pieces from Dalmatia, buried c. a.d. 465–470, during the reign of the Byzantine Emperor Leo, suggests a late fifth-century date for the manufacture and circulation of radiate copies in view of the fine condition of its four barbarous radiates, one AE3 (small) and three minimi. size imitations were first produced [ Plate IV, 1], very shortly afterwards to be followed (between 270 and 280 on the Continent and c. 290 in Britain) by minimi [ Plate IV, 2]. Copies in both sizes were struck [ Plate IV, 3, 4] until c. 330, when they gradually came to be replaced by Constantinian and, later, "Fel. Temp." imitations. They were manufactured only sporadically for the next century or so [ Plate IV, 5, 6], until, at about the middle of the fifth century, radiate minimi were again produced [ Plate IV, 7] and, as the shortage of metal became more acute, the modules fell to "minimissimi" size. Towards the end of the sixth century, in this country, radiate copies of somewhat larger module were made, but of these the only examples which we possess are those of the Richborough Radiate hoard and a few isolated examples, mostly of uncertain provenance [ Plate IV, 8–13; cf. IV, 14–18]. Later still, in the seventh century, the Teutonic settlers, when they felt the need for a regular coinage, employed radiate models for some of their thrymsas and sceattas: thus the third-century radiates came into their own again as prototypes for an entirely new series which is quite as interesting, though also as puzzling, as that which we have been considering in these pages. Allington, Blackmoor II, Caister St. Edmund, Emneth I and II, Great Chesterford, Ham Hill, Linwood, Long Wittenham, Netley Abbey, Poole, Upton, Verulamium III and Wimblington. Blackmoor I, Clapton-in-Gordano, Coleford (Park End), Everton and Verulamium I and II. Bermondsey, Colchester, Cranfield, Icklingham IV, Redenhall, Wiveliscombe II, Woodbridge, Woodeaton and Worlebury Camp. E.g., Duston and Richborough III. E.g., Perran-ar-worthal (late 5th century), Hayle, Mere and Whitchurch (all fifth to sixth centuries) and the Richborough Radiate hoard [Richborough IV] (c. 600). H. Mattingly & W. P. D. Stebbingin Num. Notes & Monographs, No. 80, p. 13. For a very sound argument for the late sixth-century date of the hoard based on stylistic affinities of certain of its coins with Saxon sceattas (which appeared probably about half a century later), see Derek Allen, in an appendix to the Monograph (ibid., p. 117). The lateness of the hoard is also suggested by the presence of a few hybrids with radiate obverses and reverses copied from fourth-century "Fel. Temp." and "Gloria Romanorum" types. The date of production of these pieces must be placed considerably later (200–300 years?) than the date of their prototypes. I am also indebted to Mr. Askew for this suggestion, the possibility of which had not previously occurred to me. In view of the statement at the end of this paragraph, it must not be supposed that all coins struck on orichalcum flans are late in date; there also exist specimens of a definitely "contemporary" style, and we may imagine that this method of improvising flans was in use at least from the latter half of the third century. Duisburg, Metz(? ), Montdidier, Oisseau-le-Petit, Pezou, the Saône, Ste. Honorine-des-Pertes, Strasbourg, Toucy, Verdes and the Vosges. Num. Chron., 1937, pp. 211–228. The coin of Carausius was in mint state. The twenty barbarous were composed of six large-size copies and fourteen minimi. Composed of one large-size copy and ten minimi. All the regular coins were uncirculated. But see CCRB, p. 115, n. 5. The orthodox Victorinus was worn: all the copies were in mint state. The general condition of this hoard was very good, coins of Gallienus, Claudius II and Victorinus being in mint state. The account of this hoard includes site-finds: the hoard itself, of radiate and diademed minimi, had been scattered. It is not certain whether these pieces formed part of the hoard or not—see NNM, 80, p. 10. The respective accounts of this hoard are at variance with one another. Wright gives the barbarous as six radiate minimi (followed by Sutherland in CCRB, Appx. I, p. 116) and Roach Smith (in NC, 1859) gives only two radiates, both of which appear from their description to be at least semi-barbarous, and one hundred thirty fourth-century pieces, including "rude copies." The fullest account is in the Kenchester Report, I, which gives two radiates, one hundred eighteen fourth-century from Constantine I to Valens, six uncertain and six minimi. Anglesey : ?Din Lligwy. AAST, 1929, p. 26. Din Sulwy. AAST, 1929, p. 26. Berkshire : Abingdon. CCRB, p. 181. Frilford, nr. Abingdon. Arch., 1868, pp. 417–485. Buckinghamshire : Stone. CCRB, p. 181. Carnarvonshire : Caerhun. ACb, 1925, pp. 322–341. Segontium (Carnarvon). ACb, 1922, pp. 313—315. Cheshire : Chester. CASF, 1939, pp. 44–45. Denbighshire : Castle Lyons. YC, 1930, pp. 87–97. Great Chesterford. NC, 1934, pp. 225–227. Gloucestershire : Bourton-on-the-Water. BGAST, 1934, pp. 121–128. Chedworth Villa. NC, 1865, pp. 175–179. Chesters Villa, Woolaston. ACb, 1938, p. 114. Cirencester. NC, 1936, pp. 261–263. Hampshire : Bitterne. NC, 1934, pp. 223–224. Hengistbury Head. Rept., pp. 65–71. Silchester. NC, 1929, pp. 328–332. Herefordshire : Kenchester. WCT, 1912/13, pp. 188–210. Rept. I, pp. 32–64; II, pp. 48–59. Hertfordshire : Baldock. JBAA, 1933, pp. 235–246. Great Wymondley. VCH. Herts., IV, p. 171. Verulamium (St. Albans). NC, 1859, pp. 101–141. Arch., 1934, pp. 213–247 passim. NC, 1937, pp. 212–214 passim. Otford. Rept., pp. 6, 8. Richborough. Rept. I, pp. 106–173; II, pp. 106–231; III, pp. 187–235. NC, 1939, pp. 112–119 passim. Lancashire : Chapelfield. Rept. V, p. 80. Leicestershire : Leicester. NC, 1940, pp. 24–31. Lincolnshire : Ancaster. JAABI, 1932, pp. 16–17. Lincoln. JAABI, 1932, pp. 16–17. London: London Bridge. NC, 1841 (=1842), pp. 187–194. Monmouthshire : Caerleon. BBCS, 1924, pp. 98–100. Caerwent. BBCS, 1924, pp. 95–98; 1927/9, pp. 99–100. Norfolk : Caister St. Edmund. CCRB, pp. 178–181, 183. Duston. NC, 1934, pp. 221–222. King's Sutton. CCRB, p. 178. Northumberland : Corstopitum (Corbridge). CCRB, pp. 178–182. Oxfordshire : Alchester. AntJ, l932, pp. 62–63. Bloxham. Oxon., 1938, p. 53. Ditchley Villa. Oxon ., 1936/7, pp. 65–67. Dorchester. Oxon ., 1936/7, pp. 68–69. Tackley. Oxon ., 1936/7, pp. 93–100. Shropshire : Wroxeter. Rept. I, pp. 81–96; II, pp. 54–83; III, pp. 67–112. Sussex : Patcham. VCH., Sussex 111, p. 51. Wiltshire : Atworth Villa. WAM, 1940/2, pp, 76–87. Latton, nr. Cricklade. NC, 1864, pp. 216–223. Wanborough, Swindon. NC, 1939, pp. 291–292. Worcestershire: Dorn. VCH., Worcs. I, p. 221. Yorkshire : Brough-on-the-Humber. Malton Rept. V, pp. 54–55. Hovingham. Malton Rept. V, pp. 90–92. Malton. Rept. II, pp. 84–115. The coin of Probus was in nearly mint state. Discovered in a fourth-century vase. AAST: Transactions of the Anglesey Archaeological Society. ARALM: Atti della Reale Accademia de' Lincei (Memorie). ASAN: Annales de la Société archéologique de Namur. BBCS: Bulletin of the Board of Celtic Studies. BGAST: Transactions of the Bristol and Gloucestershire Archaeological Society. BIAL: Bulletin de l'Institut archéologique liégeois. BSAF: Bulletin de la Société des Antiquaires de France. BSSM: Bulletin de la Société d'agriculture, science et arts du Mans. CASJ: Journal of the Chester and North Wales Architectural, Archaeological and Historical Society. CCRB: Sutherland: Coinage and Currency in Roman Britain (Oxford, 1937). 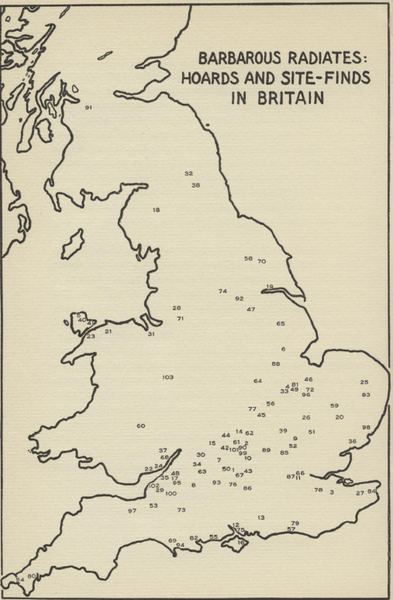 CWAST: Transactions of the Cumberland and Westmorland Archaeological Society. DAST: Transactions of the Dorset Archaeological Society. EHAST: Transactions of the East Hertfordshire Archaeological Society. JAABI: Journal of the Antiquarian Association of the British Isles. JBAA: Journal of the British Archaeological Association. JRS: Journal of Roman Studies. MGE: Mittheilungen der Geschichte für Erhaltung der gesch. Denkmäler im Elsass. MSE: Mémoires de la Société éduenne. NNM: Numismatic Notes and Monographs. PIL: Publications de la Section historique de l'Institut royal grand-ducal de Luxembourg. PSA: Proceedings of the Society of Antiquaries of London. PSAS: Proceedings of the Society of Antiquaries of Scotland. P-VCIN: Procès-verbaux du Congrès international de numismatique. RBN: Revue belge de numismatique. RCHM: Royal Commission for Historical Monuments. RHAM: Revue historique et archéologique du Maine. RSN: Revue suisse de numismatique. SNQ: Sussex Notes and Queries. TMR: Blanchet: Les Trésors de monnaies romaines (Paris, 1900). VARJ: Jahrbücher des Vereins von Alterthumsfreunde im Rheinlande. WZGK: Westdeutsches Zeitschrift für Geschichte und Kunst. The following excavation reports have also been used. Nos. 1, 2, 4. J. P. Bushe-Fox: Wroxeter, I, Oxford, 1913; II, Oxford, 1914; III, Oxford, 1916. No. 3. J. P. Bushe-Fox: Hengistbury Head, Oxford, 1915. Nos. 6, 7, 10. J. P. Bushe-Fox: Richborough, I, Oxford, 1926; II, Oxford, 1928; III, Oxford, 1932. No. 9. R. M. & T. V. Wheeler: Lydney, Oxford, 1932. No. 11. R. M. & T. V. Wheeler: Verulamium, Oxford, 1936. No. 2. P. Corder: The Defences of the Roman Fort at Malton, Leeds, 1930. F. A. Bruton: The Roman Fort at Manchester, Manchester, 1909. B. W. Pearce: Report of the Excavation Committee of the Sevenoaks Society on the Roman Site at Otford, 31 Dec. 1928, London, 1929. Minimus copying 5th century types: rev. Chi-Rho. Redenhall hoard. Norwich Museum. Semi-barbarous striking at official(?) mint: Constantine II, rev. Romae Aeternae. Own collection. Flattened globule: rev. Sol. Own collection. Overstrike: rev. Fel. Temp. Reparatio (legionary & horseman) on Fel. Temp. Reparatio (phoenix). Own collection. Cp. rev. legends (CONSTANTIVS, etc.) of "Carausius II" coins. Old coin filed down: rev. Fides. Own collection. Old coin cut into quarters and restruck: rev. Altar. Verulamium. Verulamium Museum. Old coin hammered out and cut up: rev. Pax. Colchester. Colchester Museum. Clipped from sheet metal: rev. Jupiter. Own collection. Cut from rod: rev. Fel. Temp. Reparatio (legionary & horseman). Colchester . Colchester Museum. Cast copy: rev. Sacrificial Implements. Redenhall hoard. Norwich Museum. Clipped and rounded fragment: Magnentius, rev. Chi-Rho. Worlebury Camp hoard. Taunton Museum. Clipped siliqua: Jovian, rev. Vot. V. Mult. X. Own collection. Lined-in figure: rev. Pax. Corstopitum . Corstopitum Museum. Solid figure: rev. Mars. Verulamium. Verulamium Museum. Decorated circle surrounding type: rev. male figure. Corstopitum Museum. Fel. Temp, with PLN mint-mark. Own collection. Sol with HER.DEV[SONIEN]SI legend. Own collection. Fortuna with SALVS legend. Verulamium. Own collection. Good obv. legend but blundered rev. legend: rev. Spes. Own collection. Claudian copy: rev. Minerva (exaggerated shield). Obv. die-identity with coin from Lincoln. Own collection. Disintegrated obv. (crown surviving): rev. Palm of Hilaritas? Somerset (?Cheddar). Own collection. Fel. Temp, (emphasis on horseman). Colchester. Colchester Museum. Survival of letter E in FELICITAS: rev. Felicitas. Verulamium. Verulamium Museum. Spes holding whip of Sol. Own collection. Tetricus I: rev. Salus. Corstopitum. Corstopitum Museum. Tetricus II: rev. Pax. Corstopitum. Corstopitum Museum. Claudius II, Divus: rev. Pax (hybrid). Verulamium. Verulamium Museum. Victorinus: rev. Salus. Yorks (?Methley). Own collection. Postumus: rev. Mars (base ). Own collection. Gallienus: rev. Nobilitas. Own collection. Quintillus: rev. Victory. Own collection. Probus: rev. Spes. Own collection. Aurelian: rev. Victory. Own collection. Tacitus: rev. Altar (hybrid). Own collection. Weakened type: rev. Pax with transverse sceptre. Own collection. Unattributed type: rev. Male figure. Colchester. Colchester Museum. Equestrian figure. Colchester. Colchester Museum. Double obverse: Tetricus I/Tetricus II. Own collection. Dismembered reverse. Verulamium. Own collection. Grade I, large: rev. Salus. Corstopitum. Corstopitum Museum. Grade I, minimus: rev. Victory. Obv. die-identity with coin from Colchester. Own collection. Grade II, large: rev. Salus. Corstopitum. Corstopitum Museum. Grade II, minimus: rev. Female figure. Verulamium. Verulamium Museum. Grade III, large: rev. Male figure holding trident. Corstopitum. Corstopitum Museum. Grade III, minimus: rev. Altar. Verulamium. Verulamium Museum. Radiate (rev. Altar) on Constantinian "Vota" coin. Yorks (?Methley). Own collection. Radiate (rev. Dismembered) on "Victoriae DD. Auggq. NN." (c. 340). Corstopitum. Corstopitum Museum. Contemporary striking: rev. Laetitia. Canterbury. Verulamium Museum. Early minimus: rev. Female figure. Colchester. Colchester Museum. Late 3rd or early 4th century striking? : rev. Pax, radiate. Own collection. Note: the radiate Pax is exclusively a Carausian type. Late 3rd or early 4th century minimus: rev. Sol. Peterborough. Own collection. Note: the "Carausian" portrait on the obv. and the Carausian mint-mark (C) on the rev. 4th century striking? : rev. Pax, radiate. Own collection. Late 4th or early 5th century striking? : rev. Laetitia. Colchester. Colchester Museum. Cp. style of late 4th century Æ4. Late minimus: rev. Man in tunic. Own collection. "Sceatta-like" imitation: rev. Sol. Own collection. Cp. obv. of Pl. IV. 14. "Sceatta-like" imitation: rev. Hilaritas. Own collection. Cp. obv. of Pl. IV. 15. "Sceatta-like" imitation: rev. Salus? Verulamium. Verulamium Museum. Cp. Pl. IV. 16 for inner circle on obv. and rev. "Sceatta-like" imitation: rev. Eagle. Own collection. Cp. obv. of Pl. IV. 17. "Sceatta-like" imitation: rev. Man with spear. Obv. and rev. die-identities with coin from Richborough hoard. Own collection. Cp.obv. of Pl. IV. 18. "Un-Roman" imitation: rev. Three figures. Overstruck on uncertain coin. Own collection. Cp. similar pieces from Richborough Radiate hoard. Sceatta—Men with crosses / Wolf-whorl. Own collection. Cp. rev. of Pl. IV. 8. Thrymsa—Head/ Cross. Warminster, Wilts. British Museum. Cp.obv. of Pl. IV. 9. Sceatta—Facing head / Dragon. Own collection. Cp. circles surrounding types on Pl. IV. 10. Sceatta—Degraded head / Degraded standard. Own collection. Cp. rev. of Pl. IV. 11. Sceatta—Radiate head / Degraded standard. Own collection. Cp. obv. of Pl. IV. 12. MINIMUS FROM REDENHALL HOARD: 1. SEMI-BARBAROUS: 2 EXAMPLES OF FLAN MANUFACTURE: 3–12. STYLISTIC VARIETIES: 13–15. UNOFFICIAL MINT AT LONDON: 1. VARIETIES OF LEGENDS: 2–4. VARIETIES OF TYPES: 5–9. PORTRAITURE: 10–20. REVERSE TYPES: 1–5. GRADES OF COPIES: 6–11. OVERSTRIKES: .12–13. SUGGESTED CHRONOLOGICAL SEQUENCE: 1–13. ANGLO-SAXON: 14–18. Vols. 1–13: Monthly, May, 1866-April, 1879. Vols. 14–46: Quarterly, July, 1870-October, 1912. With many plates, illustrations, maps and tables. The numbers necessary to complete broken sets may, in most cases, be obtained. An index to the first fifty volumes has been issued as part of Volume LI. It may be purchased separately for $3.00. Sydney P. Noe. Coin Hoards. 1921. 47 pp. 6 pls. 50ȼ. Edward T. Newell. Alexander Hoards—Introduction and Kyparissia Hoard. 1921. 21 pp. 2 pls. Out of print. Howland Wood. The Mexican Revolutionary Coinage, 1913–1916. 1921.44 pp. 26 pls. Out of print. Gilbert S. Perez. The Mint of the Philippine Islands. 1921. 8 pp. 4 pls. Out of print. Edward T. Newell. The First Seleucid Coinage of Tyre. 1921. 40 pp. 8 pls. Out of print. R. B. Whitehead. Pre-Mohammedan Coinage of N. W. India. 1922. 56 pp. 15 pls. Out of print. George F. Hill. Attambelos I of Characene. 1922. 12 pp. 3 pls. Out of print. Howland Wood. Commemorative Coinage of the United States. 1922.63 pp. 7 pls. Out of print. Howland Wood. Tegucigalpa Coinage of 1823. 1923. 16 pp. 2 pls. 50ȼ. Edward T. Newell. Mithradates of Parthia and Hyspaosines of Characene. 1925. 18 pp. 2 pls. 50ȼ. H. Alexander Parsons. The Earliest Coins of Norway. 1926. 41 pp. 1 pl. 50ȼ. Edward T. Newell. Some Unpublished Coins of Eastern Dynasts. 1926. 21 pp. 2 pls. 50ȼ. Harrold E. Gillingham. Spanish Orders of Chvualry and Decorations of Honor. 1926. 165 pp. 40 pls. $3.00. Sydney P. Noe. The Coinage of Metapontum. (Part I). 1927. 134 pp. 23 pls. $3.00. Gilbert S. Perez. The Leper Colony Currency of Culion. 1929. 10 pp. 3 pls. 50ȼ. Alfred R. Bellinger. Two Hoards of Attic Bronze Coins. 1930. 14 pp. 4 pls. 50ȼ. D. H. Cox. The Caparelli Hoard. 1930. 14 pp. 2 pls. 50ȼ. Bauman L. Belden. A Mint in New York. 1930. 40 pp. 4 pls. 50ȼ. Edward T. Newell. The Kuchük Kòhne Hoard. 1931. 33 pp. 4 pls. $1.00. E. T. Newell. Two Hoards from Mintumo. 1933. 38 pp. 5 pls. $1.00. A. F. Pradeau. The Mexican Mints of Alamos and Hermosilla. 1934. 73 pp. illus. 3 pls. $1.50. E. T. Newell. A Hoardfrom Siphnos. 1934. 17 pp. 1 pl. 50ȼ. Agnes Baldwin Brett. Victory Issues of Syracuse after 413 B. C. 1936. 6 pp. 2 pls. 50ȼ. Edward T. Newell. The Pergamene Mint under Philetaerus. 1936. 34 pp. 10 pls. $2.50. Charles C. Torrey. Aramaic Grafiti on Coins of Demanhur. 1937.13 pp. 2 pls. $1.00. George C. Miles. A Byzantine Weight Validated by al-Walid. 1939. 11 pp. 1 pl. 50ȼ. Eunice Work. The Early Staters of Heraclea Lucaniae. 1940. 40 pp. 8 pls. $2.00. Arthur D. McIlvaine. The Silver Dollars of the United States of America. 1941. 36 pp. 1 folded pl. $1.00. Sydney. Noe. The New England and Willow Tree Coinages of Massachusetts. 1943. 56 pp. 16 pls. $3.00. Edward T. Newell. The Byzantine Hoard of Lagbe. 1945. 22 pp. 8 pls. $1.00. Bluma L. Trell. The Temple of Artemis at Ephesos. 1945. 71 pp. 28 pls. $2.00. Karel O. Castelin. The Coinage of Rhesaena in Mesopotamia. 1946. 11 pp. 17 pls. $2.00. Sydney P. Noe. The Oak Tree Coinage of Massachusetts. 1947. 23 pp. 10 pls. $1.50. George C. Miles. Early Arab Glass Weights and Stamps. 1948. 168 pp. 14 pls. $5.00. "The American Numismatic Society Museum Notes" is a publication consisting principally of brief notes and papers on items in the Society's collections. I—1946. 106 pp. 23 pls. II—1947. 118 pp. 19 pls. $1.50 each III—1948. 154 pp. 26 pls. $5.00. Edward T. Newell. The Coinage of the Eastern Seleucid Mints from Seleucus I to Antiochus III. 1938. 307 pp. 56 pls. $6.00. George C. Miles. The Numismatic History of Rayy. 240 pp. 6 pls. $4.00. Alfred R. Bellinger. The Syrian Tetradrachms of Caracalla and Macrinus. 1940. 116 pp. 26 pls. $5.00. Edward T. Newell. The Coinage of the Western Seleucid Mints from Seleucus I to Antiochus III. 1941. 450 pp. 86 pls. $10.00. A quarterly listing of current numismatic publications with abstracts of their content. Subscription price to non-members is $1.00 per year postpaid. Single current issues, $.35 each. George H. Clapp and Howard R. Newcomb. The United States Cents of the Years 1795, 1796, 1797 and 1800. 1947. 74 pp. 4 photographic pls. Bound in cloth. $10.00. Edward T. Newell. The Coinages of Demetrius Poliorcetes. London. Oxford University Press. 1927. 174 pp. 18 pls. $5.00.